I visited in March, and I tend to believe the locals who told me this was the best time of year to visit. The weather was perfect and everything was in bloom. As we traveled from Casablanca to Rabat, we were amazed at the beauty of the countryside: incredible greenery, fabulous wildflowers running riot in fields and on hillsides, olive groves, lush farms, and rows of trees interspersed between small towns. We followed the curve of the country, the Atlantic Ocean off to our left, and finally arrived in the medieval city of Rabat just after noon. It was lunchtime, so our first stop was, of course, a restaurant: Borj Eddar, a wonderfully weathered seaside establishment in an ancient, golden-stone building with a view of the ocean and the nearby walled city. We enjoyed a splendid meal of saffron-tinted fish soup, fresh, charcoal-grilled sardines, and a flavorful white fish for which we could get no recognizable name. Then it was off for a hike through Rabat. We wandered through the narrow, labyrinthine alleyways of Rabat’s medina (Muslim Medieval walled city), through the kasbah, or palace, and into the riad, or garden. A riad should include sound (fountains, birds) and color (flowers and fruit). This riad, ringed by high, crenellated walls, accomplished these goals, with tiled fountains, lawns dotted with flowers, and trees filled with incredibly bright oranges—which I in time learned was pretty much the standard in Morocco. The meal started with traditional hand washing, as meals are eaten with hands (traditionally—it was not expected of us). A silver bowl filled with rose petals was held beneath our hands as warm rosewater was poured over our fingers from a silver kettle. Then dinner was served. The meal started with a “salad” course: potato with cilantro, cucumber with tomato, spinach, eggplant, beets with onion and cilantro, fava beans, and peppers with onions. Next, we were served the famed Moroccan specialty bestila, a pigeon pie with a flaky phyllo crust, dusted with powdered sugar and cinnamon. Then came briwat, small, fried pastries filled with meat. This was followed by three tagines—Morocco’s signature roast/stew. One was lamb with raisins and almonds, one was beef with artichoke bottoms, and one was chicken with preserved lemon and brown olives. Dessert was jawhara—a stack of crispy phyllo rounds layered with cream and milk, honey, almonds, and rosewater. It was delicious, the rosewater giving it an almost ethereal quality. We were off the next day for more adventures. We visited Meknes, another of the four imperial cities. Meknes was built by Moulay Ismail, who was a contemporary of Louis XIV (and the two exchanged gifts). Moulay Ismail was a powerful and ruthless leader who was famous for his thriving white-slave trade. However, he was admired for having brought together the country, uniting independent states, tribes, and small kingdoms into the larger kingdom of Morocco. 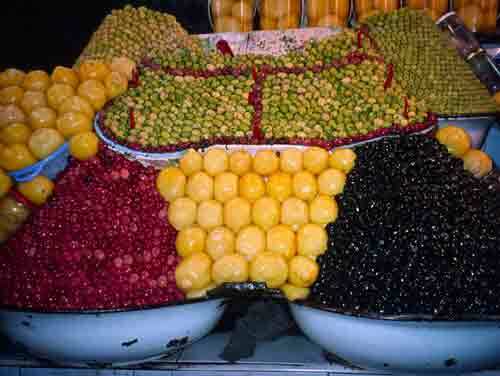 Meknes offers fabulous ruins and reminders of this period, but is also the site of a glorious market. In the great market near the Bab Mansoor Gate, handsome, tile-roofed stalls are piled high with tagines and pots, spices and confections, olives and preserved lemons, veggies, pastries, breads, meats, and cages full of chickens and pigeons. We wandered through the narrow, crowded alleys that wound between the lushly stocked food stalls, stopping to admire the skill with which everything was displayed—perfect piles in elaborate geometric patterns. Just stunning. Next, we reached Fes, another imperial city and the location of what is considered to be the most fabulous medina still in existence. The medina of Fes is like another world—and another time. This World Heritage Site, which covers 64 square miles, is home to 500,000 people—and 7,000 donkeys and burros. It is an incredible, ancient labyrinth—one where you really must have a guide, as there are 9,000 alleys, 850 of them dead ends. The medina is a heaving sea of humanity. Everyone is bustling, going somewhere, carrying something, making something, selling something. 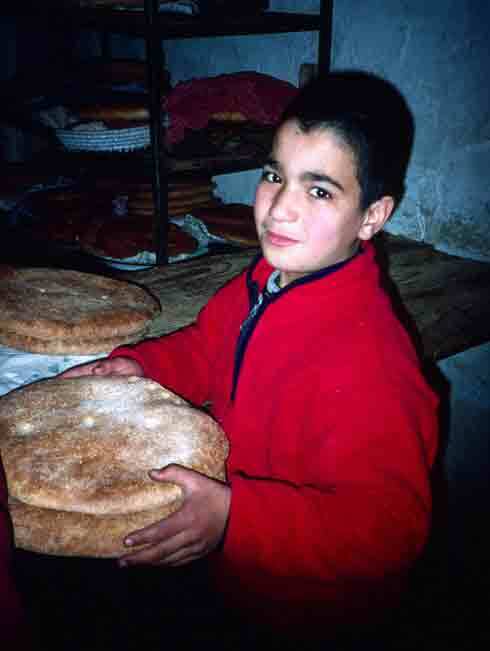 Children carry dough to the communal ovens for baking (1/2 dirham per loaf, to have your bread baked). Students dash into the Koranic schools. Merchants cry to clients. Merchandise teeters in great piles, hangs from rafters, spills out of doorways. Heavily laden donkeys complicate transit through the narrow, crowded alleys. We listened for the cry of “balak, balak,” the warning that a donkey is being driven through, usually by someone whose view of the alley is blocked by the donkey’s burden. At the local community oven in Fez. Fes was definitely a highlight of the trip—but not the only highlight. We crossed the impressive, snow-capped Atlas Mountains. We drove along roads built by the French Foreign Legion. We dropped down into the Tafilalt Valley, the largest oasis in Morocco (kind of like the Grand Canyon filled with date palms), and finally went off road. We spent three nights camping in the Sahara. There were so many delights there: the incredible majesty of the undulating red-gold dunes, the Berbers and Touaregs, and the almost overwhelming star-show at night. We visited a nomad family in their tent, and we even got to spend a morning traveling across the desert by camel. 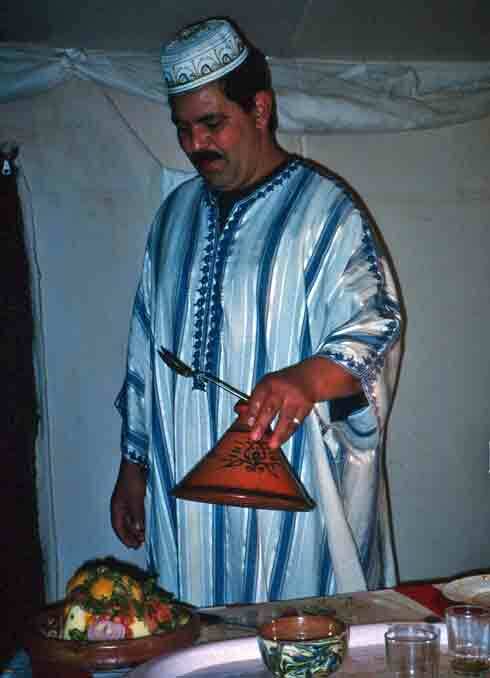 Berber chef serves traditional tagine. We really did far too much for me to even hint at it all. We visited farms, schools, and private homes. We met locals. We got our hands hennaed. We bought fossils (Morocco is incredibly rich in fossilized sea creatures). We saw an astonishing variety of scenery—desert, ancient town, oasis, snow-capped mountain, pine and cedar forests, verdant farms, deep gorges, and seashores. (No wonder this is a popular place to make movies—from Lawrence of Arabia to The Man Who Would be King to Jewel of the Nile— everything you need is within a day’s journey.) We stayed in Tineghir and Ourzazate. We drove though the Valley of Roses and explored the magnificently ancient Aït Ben Haddou, a mud-brick city that was used as a set in, among other films, Gladiator. We ended our journey in Marrakech, a wonderfully cosmopolitan city that is very Moroccan but still sufficiently Westernized to make you feel like you’ve begun your trip home. We did all the things one is supposed to do in Marrakech. We visited the famous museums, palace, and gardens, ate local specialties (michoui, a pit-roasted, butter-and-herb basted lamb you eat with your hands, dipping it in freshly ground cumin and coarse salt, and chicken tagine au citrons, specialty of the restaurant Dar si Aïssa, and one of the best chicken dishes I’ve ever eaten), rode around town in caleches, perused shops, and hung out in the fabulous town square, the famous Jemaa al Fna, where snake charmers and colorfully dressed water sellers vie for one’s attention. It was great. Our farewell dinner was in a palace that had been turned into a restaurant called The Red House. Our feast began with brionates (fried, meat-stuffed pastries) and an array of Moroccan vegetable salads. For our main course, we were served traditional Marrakech pigeon pie (whole pigeon baked in phyllo pastry with onions and cinnamon), tagine of lamb with tomato and onion, and a vegetarian couscous. Dessert was an orange salad that I felt certain must have been the ambrosia the Greek gods were eating on Olympus—the rosewater lifts the oranges to an entirely new plain. It is hard to do justice to Morocco in one article. The layers of history, the physical beauty, the fascinating cultures and cuisine, and the friendly people made it a most memorable destination. One guide had given us a speech about how much our visiting Morocco means to the country, and how every penny we spent would help the economy and help keep the old crafts alive. Tourism is Morocco’s future, he said, and he hoped we would be taking good stories home with us. No problem there—for us, good stories were even more abundant than souvenirs. This story originally appeared in a slightly different form in Hungry Magazine. We would love to republish this article on The View from Fez. Can you email us if that is okay. We would naturally include a link back to your blog. really i recognized my home land country in your article, glad that you like it.